FlyView will open a unique virtual reality attraction where visitors can visit Paris from the sky with a jetpack, taking in real-life 360° views of monuments and scenery-no computer graphics here! This permanent attraction makes possible to fly over the world's most beautiful city, a dream come true for millions of people. Visitors enter FlyView from Place de l'Opéra, they will arrive in a lobby resembling an airport terminal with check-in counters, flight attendants and screens announcing upcoming flights. The launch area has 50 jetpacks, making it one of the world's largest virtual reality installations. 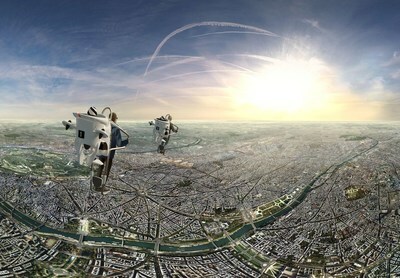 Once on board its jetpack (mounted on actuators), and equipped with a virtual reality helmet (HTC Vive), the visitor sees himself take off and rise above the rooftops of Paris. The flying sensations are more real than life. An unprecedented technological feat! The itinerary explores Paris's main monuments in a totally unique way. It will be an exhilarating 13 minutes! While everyone has the same itinerary, each person will see different things because of the immersive, 360° view. This sophisticated device synchronizes the platform with the jetpack's movements-taking off, flying forward, stopping for panoramic views, moving sideways, and dropping down next to a monument-to create an immersive experience over Paris with ultra-realistic flying sensations that little ones and grown-ups alike will love. The experience is breathtaking. The views over Paris are magnificent. The flying experience is spectacular. "FlyView is my childhood dream of flying and seeing the world from above come true. I hope to share this incredible experience with as many people as possible. This experience brings together poetry and innovation to create another high-quality cultural activity in Paris. I want to offer Parisians and visitors to Paris an exhilarating adventure that is both accessible and unforgettable," says Arnaud Houette, FlyView founder.